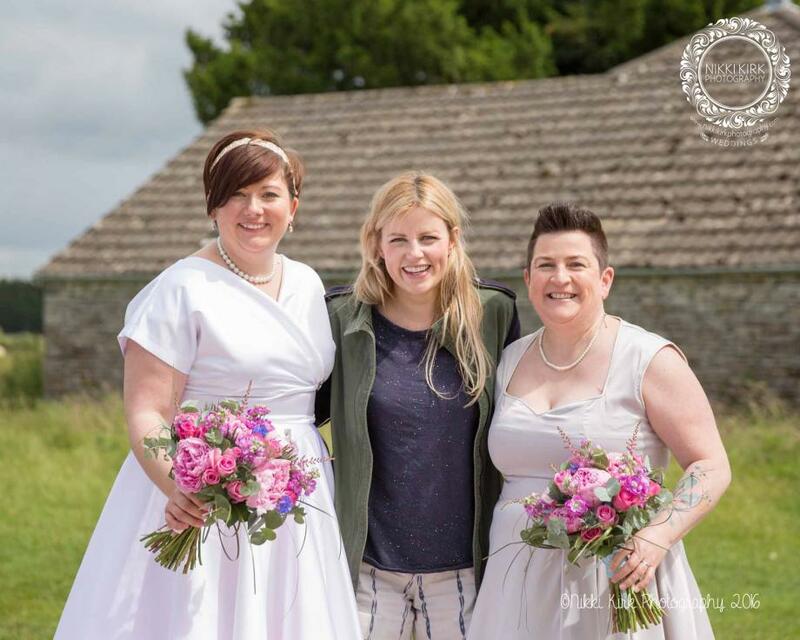 Tracey and Amy had chosen The Old Lodge on Minchinhampton Common in Gloucestershire for their wedding day ceremony and celebrations this summer and goodness what a lovely setting, absolutely perfect for this perfect couple. I’ve known Tracey since I was at school with her younger brother Richard being in my group of friends and working with Tracey at Boots The Chemist in Cirencester as a Saturday girl and during uni holidays. When she told me she was marrying Amy I was over the moon for her and for them both. They are such a connected couple and clearly enjoy just being in each others company. To photograph their wedding was a real honour. The day dawned dry and bright but a little breezy and up on the Common you certainly knew about it! Minchinhampton Common and The Old Lodge which is set up on the Common makes for a glorious location for a wedding with spectacular views and of course the animals that roam free across the Common; donkeys, cows, horses, sheep! You name it, its up there! Tracey and Amy had chosen fabulous 50’s style full skirted dresses with the bridesmaids (Amy’s sister and Tracey’s sister in law) in complementary pastel colours making for an incredibly pretty set of dresses. Amy’s shoes were out of this world – two brides for the heels! The girls were both escorted by their proud Fathers, with their three nephews leading the way down the aisle and before you knew it they were wife and wife. After their ceremony which was held outside we jumped in the car to go to Winstones ice cream and on the way to the car who should we see but Countryfile’s Ellie looking effortlessly fabulous in shorts and a walking jacket (how does she do that?!). She was so kind and took the time for Amy and Tracey to have their photograph taken with her. We then went across to Winstones ice cream which is one of Tracey’s and Amy’s favourite places and of course they were generously treated to ice creams on their big day by the team at Winstones! Back at The Old Lodge there was one very special gift that their dear friend Brenna had carried across all the way from the USA – a stunning glasswork of their tattoo art. When Tracey and Amy link arms their tattoos join to create one – this is what was on the glasswork. Dinner was served with guests looking out over the Common. The speeches from both Dad’s, Tracey’s brother and Amy’s sister and the new couple were emotional and full of love and happiness. It was a wonderful day and one that will live with me for a long time. When you see an old friend marry the love of her life it makes for a lot of goose bumps over the course of the day. Thank you to the team at The Old Lodge – you absolutely rock!